King cakes are one of the most prized food traditions in the Southeastern United States. From The Florida Panhandle to east Texas, you’ll find king cakes in bakeries and grocery stores from late December through early March. King cakes originated in Europe as a celebratory food of the Feast of Epiphany, or Twelfth Night Celebration. The cakes represented the three kings who traveled to celebrate Christ’s birth and often contained a bean or trinket that represented the Christ child. 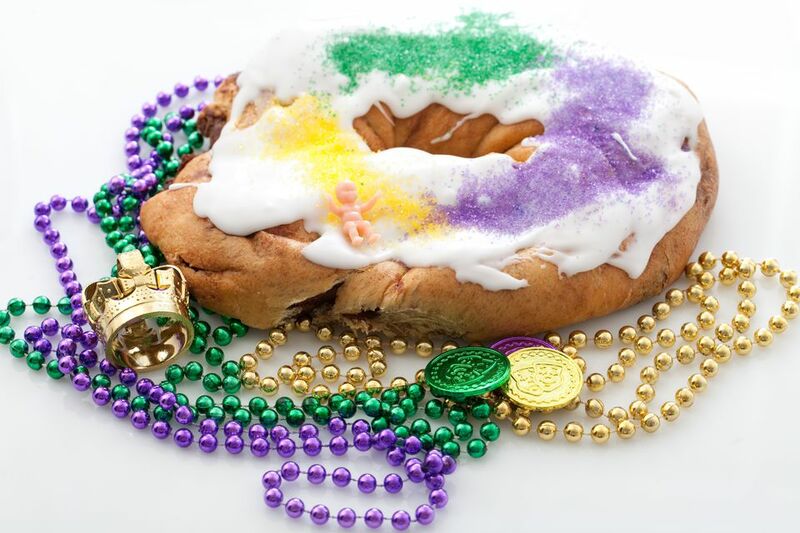 King cake parties became a festive tradition in Western Europe during the 17th century. Settlers from France and Spain brought the king cake tradition to the southeastern region of the United States where it is still popular today. Although king cakes are now more closely associated with Mardi Gras, the king cake season extends from just after Christmas (the Twelfth Night) through Mardi Gras. Today’s king cakes are a circular loaf of brioche-like bread, covered in sugar or frosting and may contain a variety of fillings. Cinnamon is the most traditional king cake filling but fruit, cream cheese, praline and custard have all become popular in recent years. The frosting or sugar on king cake is usually colored green, purple and gold to represent Mardi Gras. A small plastic baby trinket is included with every king cake so it can be hidden inside of the cake after purchase. The tradition of hiding the plastic baby inside of the king cake is a fun game that is enjoyed by both young and old. Whoever gets the slice of cake with the baby hidden inside is responsible for purchasing the next cake. Because of this tradition, king cakes are a staple item at parties, gatherings and office break rooms from December through March. With everyone taking a turn purchasing one, the flow of king cakes seems to never end! Even if you don’t live in ‘King Cake Alley,’ you can still try a king cake. Many bakeries in the region ship king cakes nationwide throughout the season. Or, if you're handy in the kitchen, try baking a king cake at home!